The strong winds caused high waves to crash over the promenade at Llanfairfechan, Conwy. 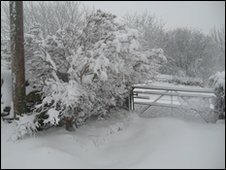 Unseasonal spring weather including heavy snow and high winds have caused problems in parts of Wales. The strong winds, combined with high tides, caused flooding in seaside locations on the north Wales coast. Emergency services were called to Llanddulas, near Abergele and Llanfairfechan between Conwy and Bangor. Drivers across Wales were warned of hazardous conditions due to snow, and some schools were forced to close. Adverse weather has seen both Irish Ferries and Stena Line cancel high-speed sea crossings. 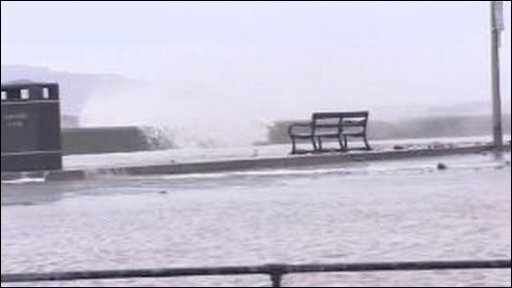 North Wales Police said it had received calls about flooding in Llanfairfechan, Conwy, as strong winds caused high waves to crash over the promenade. The fire service was pumping out the gardens of several properties. In Denbighshire, the Horseshoe Pass and a stretch of the A543 near Bylchau were closed. Along the coast in Llanddulas, Conwy, the sea wall was breached causing flooding in Beach Road. The fire service was at the scene, with the water incident unit from Bangor, helping residents to protect their properties from sea water. One home was evacuated. Officers from Conwy's Environment Service were on-site in Llanfairfechan and Llanddulas. A spokesman for Conwy council said five properties had been affected in Station Road, Llanddulas, as a result of waves overtopping the sea wall. He said at Llanfairfechan initial reports indicated approximately 10 properties were affected by flooding with affected properties evacuated. Sandbag were being distributed to homes in the area. The Holyhead coastguard said high winds and high tides were to blame. Firefighters were also called to Garford Road, Rhyl, to deal with flooding in the street. There have also been problems on roads in parts of the country. In Carmarthenshire, motorists using the A4069 Brynaman Mountain Road were urged to approach with care due to dangerous driving conditions. Routes around Llandeiniolen near Llanberis were "hazardous" and high winds led to speed restrictions on the M4 Kenfig viaduct between junctions 37 and 38 and the M48 Severn Bridge. The Met Office said there was a "moderate risk" of severe weather for Wednesday affecting higher parts of Conwy, Denbighshire and Gywnedd, with 5cm -10cm (1.9in - 3.9in) of snow falling above 300m (984ft) and a risk of drifting snow in high winds. 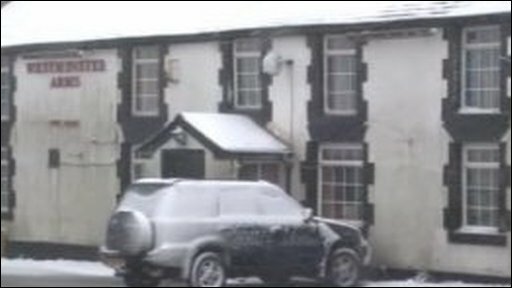 Gwaun Gynfu school, Deiniolen and Carmel Primary School, near Caernarfon, Gwynedd, were closed due to the adverse weather. Two roads in Denbighshire were closed, the A543 between Brenig and Bylchau, and the A542 Horseshoe Pass. Denbighshire council said gritting teams had been deployed to deal with snowfall. Snow has also been reported in upland areas above Wrexham - Coedpoeth, Bwlchgwyn, Llandegla. Forecasters warned that parts of the Brecon Beacons and other high areas were also likely to be affected. Areas around the heads of the valleys woke up to a dusting of snow, causing delays on roads. I have just been down to the promenade to say good bye to it. It was already is quite a poor state and is now being battered by 25ft waves with the spray rising 50ft over the railwayline to Holyhead. I doubt there will be much left to see when the sea settles. We have about 7cm of snow here and snow drifts of about 30 cm. the winds are quite powerful of about 50 mph and the power is on and off, luckly I have a laptop. I had forgot how much the wind and rain cuts into your skin. Today is not a day to play out in but to keep warm inside. I hope my fence will stay up in this wind. It was flapping like a flapping thing during the night. I don't want to spend another Easter weekend fixing it. Ba'h.